Uniquely designed for timeless wear! Inspired by the art of Origami. One side folds into pocket for small change. 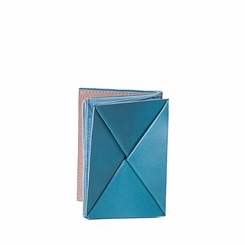 One side folds into a credit card space. Middle partition for bills and additional space. Fold to close and unfold to open. Made in Israel from Leather.